Why is your adventurer going to Orlanth Heights? Is it to visit the Puppet Troupe Shrine? Perhaps you are a Troll checking out the rumours of a Lead Mine on this hillside? Do you seek Sorcerer’s Tower that is built on its edge? Or perhaps you just want to get to its vantage point and throw magic stones across the gorge at the fort of the hated Lunars. There are many reasons to go to the sacred cliffside that is Orlanth Heights. In this 13th Age Glorantha adventure, you will explore them. No experience of Glorantha or 13th Age required. This adventure is designed as a straightforward introduction to both setting and system. Glorantha is a psychedelic mythological fantasy setting, with more in common with Ancient Bronze Age than the Medieval Period. 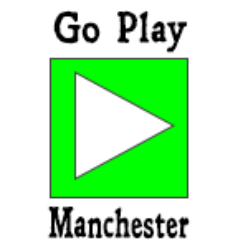 For more information visit its dedicated web site. 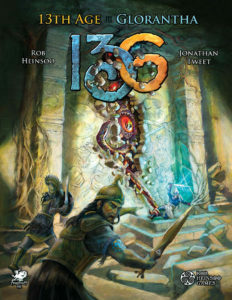 13th Age is Jonathan Tweet’s (3rd Edition D&D ) and Rob Heinsoo’s (4th Edition D&D) love letter to D&D. As well as the familiar classes, levels, armour classes and hit points, it has many rulings that make it a more story focused narrative game. 13th Age Glorantha mixes the two together. Its probably the most accessible version of Glorantha produced, with a system familiar to D&D fans adapted to tap into Glorantha’s exciting themes, such as fighting chaos horrors and going on magical Hero Quests. Produced by the fine people who publish Call of Cthulhu, Chaosium Inc, this review on the Gnome Stew blog gives a more comprehensive rundown of the game.